First Communion is a significant religious rite of passage celebrated with joy and reverence for what the celebration is truly about — the ultimate sacrifice of Christ. Whether you throw a large party or host something simple like a small family gathering, here are 35 ideas to help you celebrate your communicant and their upcoming First Holy Eucharist. Meal Times - Many of your food decisions will depend on the time of day and your budget. For a morning Mass, simple sliced meats and rolls make a nice menu. For afternoon Mass, cake and punch are a yummy treat. If the party’s in the evening, think about serving hors d'oeuvres, salad and an entree to fill hungry tummies. 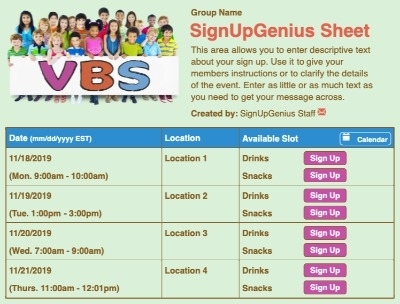 Party Prep Help - If you have extended family coming in, create an online sign up to list ways they can help with food or party preparation, so you can focus your attention on preparing your child to understand this important event. Friends and family will happily help make your celebration easier, just ask! Ice Cream Cake - An ice cream cake is a great dessert option because you don’t need to buy ice cream separately. Serve ice cream cake with other small desserts like cookies, macaroons or pastries. White Cake - Purchase a white cheesecake or a large plain sheet cake and use gold decorating gel to create a cross in the middle. Decorate around the cake with white flowers like daisies, calla lilies or baby’s breath and serve on a marble try or a matching white cake stand. Offer other white desserts like yogurt covered raisins and white chocolate dipped strawberries. Cupcake Cross - Arrange two rows of white cupcakes into the shape of a cross and adorn them with small candies for extra decoration. Place extra cupcakes on cake plates around the venue for guests who want seconds, or set around the cross in the shape of a rosary. Symbolic Fruit - Create the shape of a cross using fruit pieces. Put three rows of strawberries to form the vertical lines of the cross then use pineapple, melon or blueberries to form the horizontal lines. Cookie Pops - Dip Oreo cookies in melted vanilla cake pop frosting and let them harden once you’ve added a stick for holding them upright. Once they are dry, decorate with gold or silver frosting by adding the guest of honor’s name or a simple cross. Pair with a variety of types of milk (non-fat cow’s milk, low-fat cow’s milk, almond milk and soy milk), so every guest has an option. Fondue Pots - Borrow or rent fondue pots for a fun twist on finger foods for your party. A chocolate fountain would also be a hit and is the perfect opportunity to offer a selection of strawberries, cookies, and pretzels for dipping. Specialty Donuts - If you are having a morning Mass, offer guests a sampling of sweet, creative treats with such toppings like peanut butter icing and jelly drizzle, maple icing and bacon crumbles, or s’mores (chocolate icing, marshmallow drizzle and graham cracker crumbs). Homemade Chocolates - If you’d like to serve a heartfelt symbol of first communion, order a communion candy mold online to make your own chocolates or mints. Complement the homemade chocolates with a fully stocked ice cream sundae bar where the chocolates make excellent toppings along with cherries, sprinkles and granola. Floral Everywhere - Simple spring flowers make lovely table decor for a little girl’s first communion and can be taken home by guests. If you like to emphasize a color scheme, spray paint flower pots ahead of time and stamp a small gold cross on each. Consider using fine china, old teacups or an eclectic collection of fancy tableware from friends to complete the elegant floral tea party look. Pre-event Photoshoot - Take portraits ahead of the day with the communicant in their dress or special suit, slip photos into inexpensive frames and you have personalized table decor. These pictures can also be used to create thank you cards to send to guests after the event. Focus on The Cross - A stamped image of a cross or a christening gown placed on a mini-dress form or a single baptism candle makes a personal centerpiece for your First Communion party as you celebrate the journey of faith your communicant has taken. Timeless Centerpiece - For simple table decor, have friends collect tin cans, remove labels, then wrap with thick natural rope and place two hydrangea stems inside. These are a beautiful centerpiece, and if you can get the flowers in bulk, it saves on decorating expenses. Pop of Color - An often-overlooked decorating idea is the use of colorful themed beverage or luncheon napkins. Fan these out on your serving tables with color-coordinated plates, use simple crosses borrowed from friends with a few colorful balloons and your decorating is done! Use fancy cloth napkins if you want something a bit more formal. Color of Choice - To give your First Communion party a truly festive feel, use the guest of honor’s favorite color scheme. Decorate using confetti and lots of polka dots. Create a triangle banner with the child’s name spelled out on dots with a cross at each end. Photo Display - At your party venue, place older pictures of the celebrant on a designated wall in the shape of a large cross for all guests to see how the child has grown and changed through the years. Be sure to include other spiritual milestones such as baptism or christening events. Creative Guest Book - Place a photo mat or blank photo book for guests to sign as a guest book. Include a special blessing or prayer and keep it after the event as a keepsake from the special day. Sunday School Artwork - If you collect Sunday school crafts through the years, search through them to find important lessons of faith made by the celebrant. Use the art pieces to decorate your party venue. Chalice and Bread - The simple symbolism of the cup and the bread can make a lovely theme for a First Communion party with rustic accents and fresh loaves of bread and grapes. Oatmeal cookies with white icing can be served along with jam sandwiches and sparkling grape juice, a special treat for young guests. Stalks of Wheat - Battery-powered candles tied with gold ribbon and several stalks of wheat can be the starting point for a theme celebrating the body of Christ. Serve bruschetta with traditional tomato or other toppings for a unique celebration inspired by the Bread of Life. Grapes on the Vine - A fun theme for a purple-loving first communicant, serve purple-topped cupcakes, a fruit charcuterie tray, and green and purple grapes on kabob sticks. Decorate with vines and grapes, and use a centerpiece of a gold vase with faux grapes overflowing. Images of Prayer - Search the web for girl or boy illustrated images of first communion prayer (typically a profile of a child praying) printable and use these to inspire your party theme. Have guests bring or compose a written prayer for the child and put them in a keepsake book. Double-Up - State on your invitation if more than one child will be participating in First Communion and celebrating the day at your party. Joint parties can be just as special and many hands will make light work, as they say! Words of Meaning - Download a prayer, passage of scripture or a spirit-filled poem to read at your First Communion celebration and build the after-party theme around it. The Cup of Joy - It’s not hard to find different shapes and sizes of special glasses, chalices, and the like at thrift and party stores. Use them to decorate and serve as a symbolic snack by preparing Jell-O servings in a stemmed plastic cup with a marshmallow to represent the host. Seeds of Faith - Include real plant seeds in the party favors for guests to plant as a lasting reminder of the seeds of faith that are being planted with First Communion. Decorate with containers of grass seed sprouting up out of the dirt, festive potted plants and weathered watering cans of all shapes and sizes. Frame a relevant passage of scripture like verses from Matthew 13 or Luke 8:15. Angel’s Wings - To celebrate your little angel’s First Communion, decorate with a heavenly theme (gold and white with a favorite color to accent) and serve angel cake pops made of lemon cake decorated with a smiling face, yellow icing halo and a candy lemon fruit slice cut in half and placed on each side for wings. God Bless This Child - A banner welcomes the special guest with “God Bless (Child’s Name)” and guests leave written blessings for the child such as “May the Lord bless you by…” on note cards placed around the room. A special wooden box can be crafted for the child with the date and their initials engraved on top. Place the cards inside. Rustic Remembrance - Getting your child’s name cut from a rustic piece of wood and placed over a wreath of eucalyptus, boxwood or other greenery can be a keepsake for years to come and an eye-catching centerpiece. Serve a buffet of barbeque or finger sandwiches for this simple and casual celebration theme. Life of Christ - As you celebrate the sacrifice of Christ, your party theme can celebrate his life with smoked fish for the adults (fish sticks for children), olives, fresh bread and grape juice to be enjoyed possibly in an outdoor setting with simple palm leaves in vases as a centerpiece. Photographer for a Day - Give a disposable camera to the communicant and have them take pictures of their celebration. Offer to develop the pictures and deliver them later with a special picture frame or album as a keepsake from their important day. Crafting Party - If you have a large gathering of children at your celebration and want to offer a craft, search for ideas online (like making paper doves or a monstrance made of pool noodles). This is a great way to have a unique take-home reminder of the day and keep young ones busy during the party. Bookmark It - Set up a creative station where kids can create personalized bookmarks with cardstock paper, scissors and a hole punch. Preprint Bible verses and offer stickers for decorating and ribbons to pull through the top. Decorate the venue in vintage books and bibles of all shapes and sizes. Jewelry Making - Create wooden cross necklaces or rosaries with predrilled holes and provide heavy string or twine and permanent markers for decorating. These are great for guests of all genders and most ages (because permanent markers and toddlers don’t always get along well together). Decorate the party venue with all things sparkly or go the rustic route and decorate with wooden crosses, antique furniture and burlap table runners. Preparing for First Communion may seem a bit overwhelming with both the Mass and party to plan for, but with the right planning the day will be a success! Use these tips to keep the party planning simple and focus on what’s most important — your first communicant and this significant step in their faith journey. Julie David is married to a worship pastor and after 20 years in ministry together with three daughters, she is still developing the tender balance of thick skin and gracious heart. She currently leads a small group of high school junior girls. 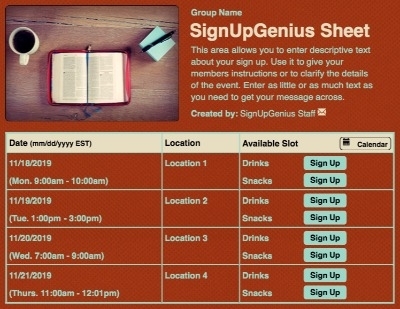 Organize worship service volunteers with a sign up. 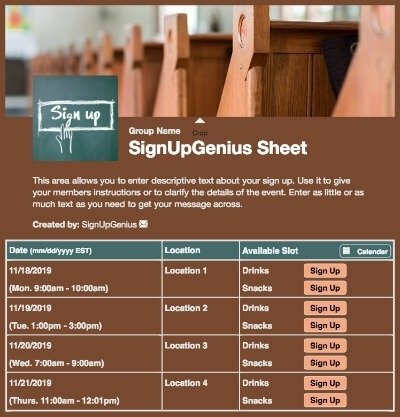 I love SignUpGenius and have introduced it to my entire staff here at First United Methodist Church in New Braunfels! I have become much more organized, and have saved a lot of paper in the process! Thank you for offering this great service and we plan to use it for years to come! Thank you again! !